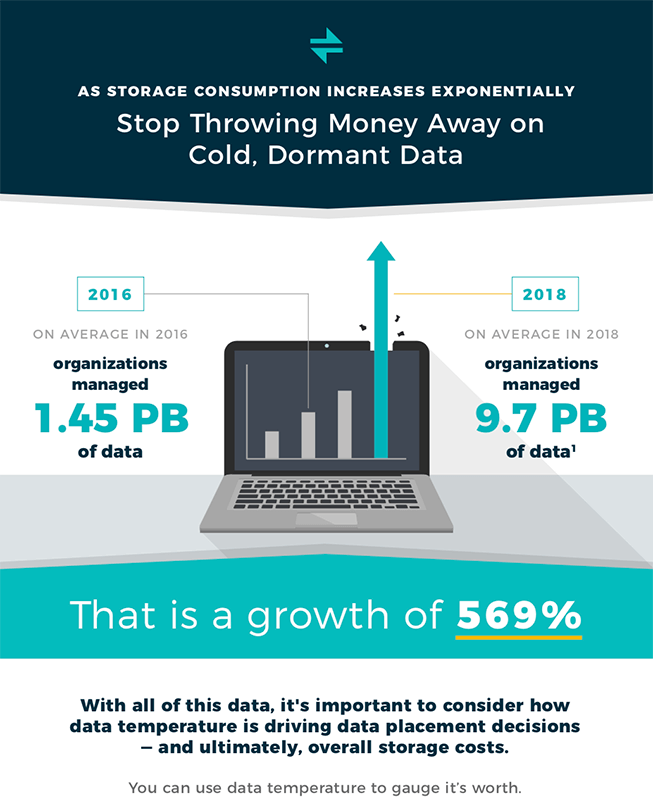 DataCore pioneered software-defined storage and is leading the parallel processing revolution that will radically redefine the economics and productivity of both the server and storage worlds. I/O processing lags behind CPU and memory innovations, creating a severe I/O performance gap. The result is slow data access, I/O bottlenecks, and server sprawl. Today’s multicore servers need software to unlock their I/O processing power. DataCore’s Parallel I/O software fully harnesses multicore processing. To prove the point, DataCore shattered the world record for price-performance. DataCore is driving the parallel I/O revolution to maximize business productivity, and its impact on servers and storage will be profound. Data keeps growing, applications need more performance, and new hardware is hard to integrate. 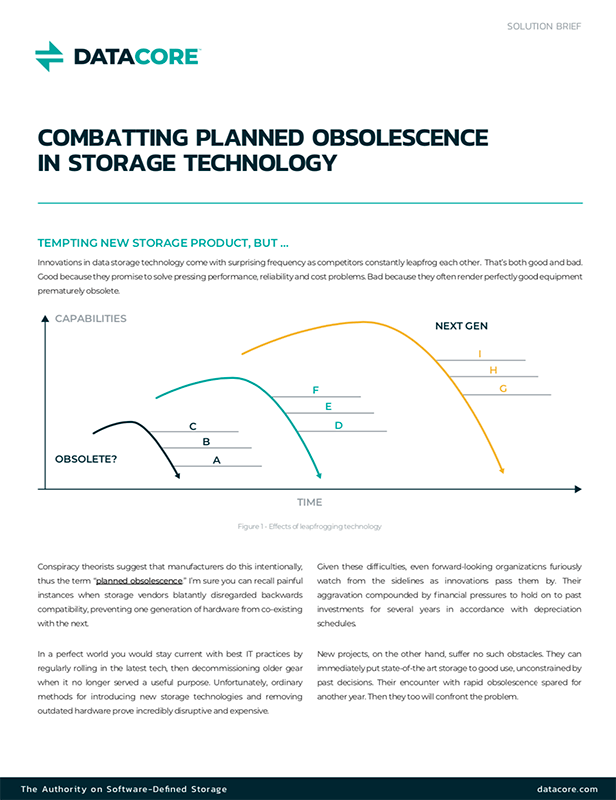 Typical storage environments have multiple devices from several manufacturers, but they can’t communicate with one another and can’t be managed from the same place, so they operate in silos, becoming obsolete in just a few years. Every hardware vendor has the same solution: throw more expensive hardware at your problems. Virtualize your storage just like you did your servers. DataCore software is a virtualization layer that sits in between your application servers and your existing storage hardware. Now all of your existing storage hardware can coexist and work together. You can now pool all of your storage resources and eliminate wasted storage capacity. Seamlessly migrate data between unlike platforms to make planned downtime a thing of the past. Create tiers of storage and automatically migrate your data between performance tiers so your applications always get the performance they need. Synchronously mirror, fail over and fall back between unlike devices. Create active-active clusters between data centers, regardless of what type of hardware you have at either end. Run directly on your application servers to transform your direct-attached storage and flash cards into a full-featured Hyperconverged Virtual SAN. Manage all of your storage from a single console, making your life a whole lot easier. Add new hardware from any vendor you choose when it’s time to scale. Surveyed DataCore customers report up to 75% reduction in storage costs, 10X performance increase. DataCore is the global leader in software-defined storage, a proven 10th-generation product, deployed at over 10,000 customer sites. Experience the DataCore productivity advantage with software-defined-storage.